The Toasty Top is a new spin on a 3 decades old convection style herbal vaporizer (log vape) design. The heart of the Toasty Top is a vitreous enamel coated, ROHS compliant, heating element which is identical to those found in all 12 volt log style vaporizers. The Toasty Top is unique in that the heating element can be removed for cleaning and/or replacement as necessary. The heating element is surrounded by a stainless steel core which allows air to pass over it and heat the air to vaporization temperatures. The voltage applied to the heating element will determine the air temperature. 12 volts will generally produce air at around 420 degrees. Wood type and room temperature will affect the final temperature. The Toasty Top is approximately 3” in diameter and 3-1/2” tall and can be made from almost any wood. The Toasty Top is designed to accept 5/16” stainless steel roasting tubes into the core center tube as with conventional convection style herbal vaporizers. The Heat Island or simply the HI, takes the convection style herbal vaporizer to a new level. It uses Heat Island Technology to get more heat from the same heating element as that used in the Toasty Top. The stainless steel core of the HI minimizes the metal mass and conduction path for heat to escape the core center tube (island) and heat the wood. Consequently, the wood stays relatively cool while the core center tube temperature reaches around 450F. The air temperature is approximately 450F with 12 volts applied. The HI is approximately 4" tall and can be as small as 1-1/2" in diameter. The internal stainless steel heat island weighs just 17 grams. There is a debris screen in the center tube as well as the space between the center and outer tubes. The HI can be made from virtually any wood as it has little impact on the final temperature. The heating element power jack is located on the bottom of the unit. The heating element can still be removed for cleaning / replacement like with the TT. 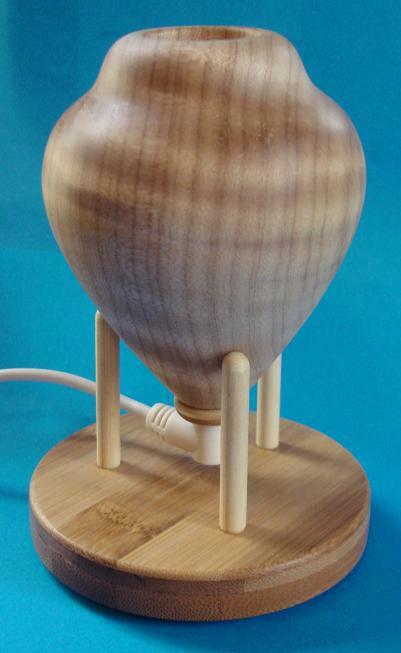 A right angled power plug is incorporated into the wood base so it sets upright like a conventional direct draw convective vaporizer. Since the HI has such a small metal mass, it will start producing vapor after being plugged in for only 5 minutes with 12 volts applied. It can take 15 minutes before the wood will start to feel warm. It is also designed for 24/7 operation. The HI does not lose temperature after each draw and can be used for near continuous operation. The HI can be used with two different roasting tube styles. It will accept 5/16" diameter stainless steel roasting tubes inside the center tube as with traditional direct draw convective vaporizers. It will also accept 3/8" inside diameter high temperature medical grade silicone roasting tubes on the outside of the center tube. 10mm glass or wood roasting tubes can also be used. The HI is perfect for use with water filtration due to the low air restriction. The Turbo Tube fits perfectly into a 14mm glass joint. The HI is so small you can hold it in the same hand while pulling the Turbo Tube to clear. The heating element / stainless steel core heats air to around 420F for the Toasty Top and around 450F for the Heat Island with 12 volts applied. Herbal material can be placed into a variety of different roasting tubes and roasted by drawing the hot air from the stainless steel core through the herbal mass. The Toasty Top is designed to accept a 5/16” stainless steel roasting tubes. The SS roasting tubes are available with high temp food grade polypropylene, hardwood, or glass mouthpieces. The various oils contained within the herbal material will vaporize at different temperatures. The temperature of the air being drawn through the roasting tube is controlled by mixing the room air with the heat sink air. The temperature increases the deeper the roasting tube is inserted into the heat sink tube. The lighter tastier oils are extracted at lower temperatures. Slow going at the beginning seems to work and tastes the best. The Heat Island is designed to accept 3/8” ID high temperature medical grade silicone and 10mm ID glass / wood roasting tubes in addition to the 5/16” stainless steel roasting tubes. The larger roasting tubes allow for greater air flow through the herbal. The herbal material should be loosely ground. Too fine of a grind will not allow adequate air flow. Place the material into the tip of the roasting tube by sucking it up like a straw. Lightly pack the material into the end of the roasting tube. Hold the roasting tube upright whenever possible to prevent loss of herbal material. Begin with the tip of the roasting tube held at a 45 degree angle into the heat sink tube. There should be a sound of air flow to ensure proper roasting. The tip of the roasting tube does not need to be any farther into the heat sink tube than is necessary to obtain a roasting temperature and still have good air flow. Too much heat too fast can scorch the herb. It should be treated like roasting a marshmallow without it burning. Hold the Toasty Top and Heat Island horizontally while inserting the roasting tube to avoid loss of herbal material. Stir the material in the roasting tube to ensure complete roasting. Blow the completely roasted material into a suitable receptacle while the tip is still warm to ease removal and reduce screen plugging. No hazardous substances (ROHS) are contained in or on the Toasty Top or Heat Island. The internal air path is all stainless steel with the exception of the lead-free vitreous enamel coated heating element and tin coated copper wires. The roasting tubes have a stainless steel screen to hold the herbal material. The core center tube also has a stainless steel debris. The internal temperature is directly related to the voltage applied. A variable voltage power supply can be used to fine tune and adjust the temperature. Voltages greater than 12 may be applied for short, supervised time periods to increase the temperature. 12 volts is generally more than adequate. 13 to 14 volts will usually provide a darker roast but at the expense of taste. No more than 15 volts should ever be applied. The heating element degrades at a much faster rate at voltages above 12. The warranty does not cover operation of the Toasty Top or Heat Island at voltages above 12. It is important to know what voltage you are applying at all times as some 12 volt power supplies can provide more than 12 volts. Should the heating element ever need to be replaced, it is threaded for easy removal. The Toasty Top and Heat Island provide a very stylish and effective aromatherapy diffuser. Essential oil can be placed in the cotton contained in a small copper cup which is then placed on the core center tube of the Toasty Top / Heat Island. The stand holds the Toasty Top level. Essential oil should not be added while the cup is on the Toasty Top or Heat Island. A silicone ring is provided on the cup to prevent finger burns while removing it hot. The Toasty Top and Heat Island both make a great hand warmer / heat massager. The wood works well to dissipate the heat from for the internal heating element contained within a stainless steel core. It generates around 7 watts of continuous heat when 12 volts are applied. It will take about 30 minutes for the Toasty Top and about 15 minutes for the Heat Island for the wood to be warm to the touch. It has a nice toasty feel and the warmth melts right into your hands. It provides a calming sensation and is great for hands with arthritis and poor circulation. Soothing heat can be applied directly to sore muscles and joints as needed. The curved surfaces and continuous heat provide comforting massages. It retains heat for a while when unplugged from its power supply. Power supplies that have a measured voltage of 12 and rated for no less than 1.5 amps with an “M” type (5.5mm x 2.1mm) plug can be used to power the Toasty Top and Heat Island. The Toasty Top and Heat Island are safe to leave plugged in at all times since the power consumption is low and the temperature at the wood body never reaches the combustion point. Only 12 volts should be applied for continuous use. Stainless steel, wood, and pure beeswax is all that is used to make a Toasty Top and Heat Island body. Never remove the heating element while it is energized or hot. Severe burns could result from contact with the hot heating element. Never touch hot metal or glass parts (including the core and roasting tubes) while the top is energized or hot. Burns could result from contact with hot metal or glass parts. At some point you will probably drop it or the cord will get pulled. The Toasty Top and Heat Island are very durable. Should the core become dislodged, it can simply be tapped back into place. Dents and dings will add character to your new friend. The Toasty Top and Heat Island is so simple and well designed that I am able to offer a limited lifetime warranty. If I caused the problem, I will fix it. If you caused the problem, I will still fix it, but it will cost you. Renewable or recycled materials are used for construction whenever possible. 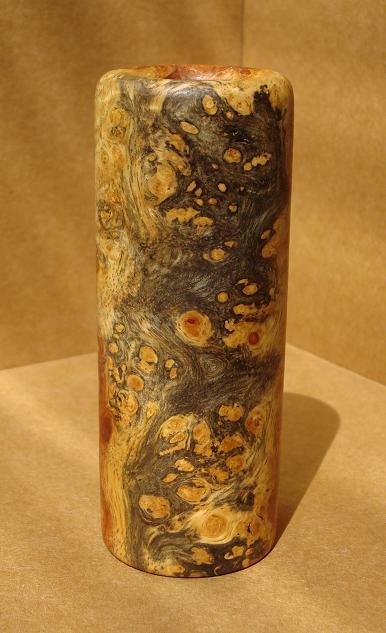 These include; Bamboo, beeswax, glass, maple wood cut-offs and hardwood scraps. The Toasty Top and Heat Island are handmade in the USA by a master craftsman. The Toasty Top and Heat Island are intended for use by adults aged 18 and older. I do not advocate nor promote the use of illegal substances. Please obey all local, state and federal laws.